Many years ago my friend Magnus told me about this fantastic program/site. I'm sure that you will have a very exiting day with this program as I did and do, not only for the impacts! Google Earth is a collection of satellite photos for the whole world and is updated continuously, today is 1% (2005) covered by high resolution photos, and it's really high resolution, about 1m. On the better ones you can even see people (at least the shadow of them) ! Look at your own house and whatever that is interesting to you, I can't tell all about it for you, try it! This is what you will find and many more! Where to find Google Earth? How to find impact craters? After I have used it for some hours I was curious to see if it was possibly to see any old impacts. I didn't believe my eye, so many! I thought it was only a hand full of impacts the world around big enough to be seen from satellite, I was wrong! I have took a couple of impacts and saved the positions with some corrections and put them in a kmz file. If you want a more complete table, go to the links above or search on internet. When you have installed Goggle Earth and it work properly you can download this file, right-click on the link below and save it somewhere on your computer where you remember it's location. The file name is impact-world.zip, it's a compressed file, use zip to unpack it. After you have unpacked the file and got the file impact-world.kmz, double click on it and the Google Earth will start. The file impact-world.kmz will be placed under temporary places (in Google Earth). Mark it or click the individual impacts you want to see, very impressive! It's easy to measure distances in Google Earth so that you can find	the diameter of an impact. It could be wise to unmark other stuff, it's a little bit distracting when a lot of flags popping up everywhere. note, not all impacts I have choose are for shore from meteorites, they maybe only have this shape! I have put some figures about the impacts, the diameter and the age. I found a lot of different values for those, specially of the age, I just took one of those. You can expect the meteorite that caused the crater to be 20 to 30 times smaller, i.e. a 30 kilometer wide impact had a 1 kilometer meteorite. It's origin could be fragments of asteroids, some impacts could come from collision with comets. A comet are like a snowball, but it doesn't matter, it's the speed that makes the crater, 36000km/h or more! When the meteorite enter the atmosphere it will almost always broken up in small pieces (smaller ones can evaporates completely, then it's a meteor) which can be found on the surface as meteorites, if they are spread out enough each will produce a crater. The original crater that the impact created have for all older eroded away, it takes only a few million years, but you can still today see the structures of it. For longer periods our surface is remade by the plate tectonic drift. The structures you find on the images are for most of them less than 500 million years. The Barringer which is an young one still have the crater left. On the moon which doesn't have any atmosphere or plate tectonic drift the craters are intact after 1000 million of years. In the Google Earth program you can even do 3-D flights with the terrain-button marked, test it on Barringer (USA)! I have read in my astronomy book that it will be created a new 50 km crater every 10 million years, maybe we will be lucky to get a fresh one to see, if we survive! 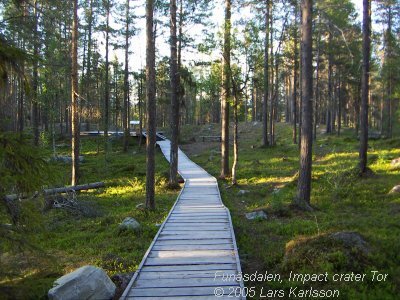 If you want to have more information about a specific impact or other things, look at my page of links, Jan-Olov at Naturhistoriska Riksmuseet in Stockholm has provided most of them about impacts. I will update the file with smaller and not so easy to see impacts in Sweden later, today the resolution of Google Earth is to low for most part of Sweden to see them, but there are a lot of big maybe impacts to see. Have an interesting day and night! I have updated the information here with a new map to make it easier for you to find these maybe impact craters. Possible impacts craters I have heard about over the years, the ones below with photos are the ones I have visited. The Björkö and Stora Värtan maybe impacts you can take the subway to, but there is nothing to see from ground level. These examples are not for sure real meteorite impacts, but it's exciting! The list below of impacts starts from Northern Sweden and go to Southern. This is a very young impact crater. Just 2000 years old. To find Tor, follow the road 84 from Hudiksvall and just before Funäsdalen you have it on the right side. A small impact crater, only 44 meters wide. They have recently found that it is a real impact crater. There are a lot of natural things that can form impacts looking craters. 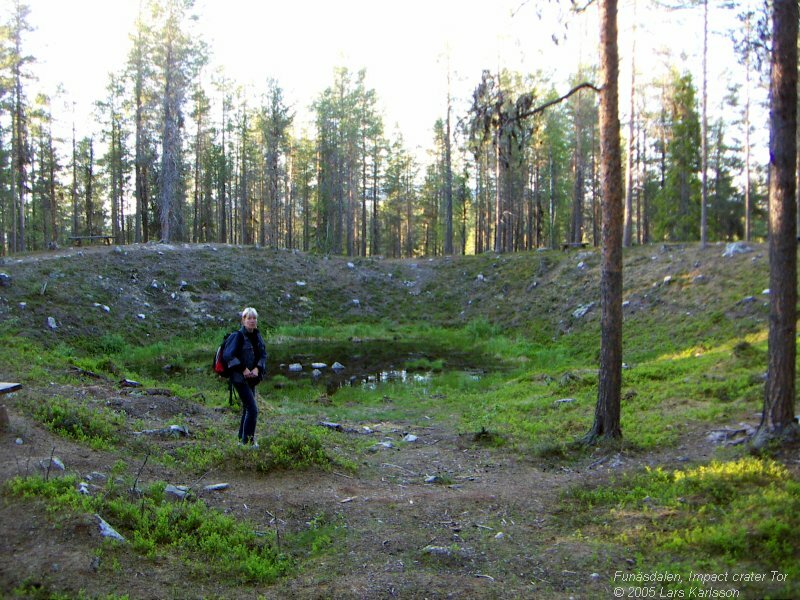 We visited this crater already 2005 and it was the first crater for me to have a close look at. At the Western side there is a stone museum and a viewpoint, you get a fabulous view from here I can promise! Do you see the other rim of the crater in the background? 19 km away from here. There is a road in the middle of the crater so you can drive by car through the crater, it's big!. This is really my favorite crater. You find it close to the town Hudiksvall. This is a really big crater. They have drilled deep holes in center of it in search for gas. Because it's so big it's difficult to have a good view of it. Friends had told me to visit the place Dalbyn on the Eastern side and from there drive with the car towards the center of the crater. I haven't done that yet so I don't know how good place it is. Are there any meteorite impacts in the neighborhood of Stockholm ? Maybe the craters with number from 6 to 9 could be, but not for sure. Do we really have an impact crater so close that we just can take the subway to it? I don't know but they have put an age to it so maybe. There is some activity here, they are drilling very deep holes to get hot water. The waters heat doesn't come from the time of impact, it comes from the cracks (from impact) that let the heat from the inner part of earth to reach close to surface. This hot water could maybe one day heat the whole city of Stockholm! You can find a lot of information about this project on the internet. Anderviken from a visit in 2013, you find it Northeast of the town Trosa. This photo is taken from the Western side of the crater rim. There is also an ancient fort up here to look at. 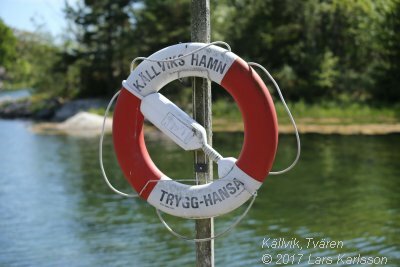 I have visited Källvik in East and Stendörren in West of the crater Tvären (which is a sea). 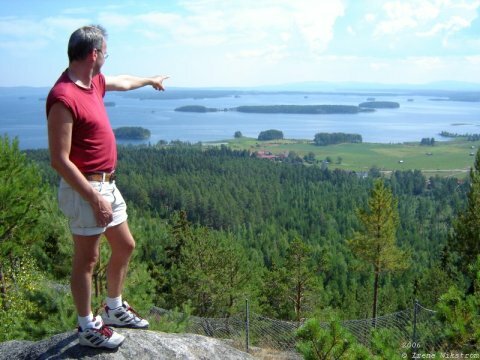 In both cases I couldn't get a free view over Tvären. Next time I visit this place I must spend more time here. Anyway, there is very nice places to visit.